If there were continualstability, there would be no need for politics, and it is to the extent thatstability is not natural, essential or substantial, that politics exists andethics is possible. whattechnotexts do when they bring into view the machinery that gives theirverbal constructions physical reality. Performative materiality suggests that what something is has to be understood in terms of what it does, how it works within machinic, systemic, and cultural domains. As a term, performative publications have a lot in common with Katherine Hayles’s concept ‘technotexts’. 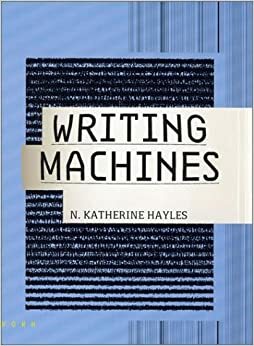 In her book Writing Machines (itself a technotext, beautifully designed by Anne Burdick in a hybrid print and ‘webtake’ version) Hayles introduces the term technotext as an relative and alternative to concepts such as hypertext and cybertext. She defines a technotext as something that comes about ‘when a literary work interrogates the inscription technology that produces it’ (Hayles 2002, 25) and elsewhere as ‘a book that embodies its own critical concepts (Hayles 2002, 140)’. In Writing Machines Hayles then goes on to analyse 3 technotexts, Talan Memmott’s work of electronic literature Lexia to Perplexia (2000), Tom Phillips artist’s book A Humument (1970), and Mark Z. Danielewski’s novel House of Leaves (2000). In this respect this project wants to emphasise that we should have more in depth discussions about the way we do research. Scholarly poethics is what connects the 'doing' of scholarship with the ethical components of research. Here, ethics and poetics are entangled and an ethical engagement is already from the start involved in the production of scholarship, it informs our scholarship. Whilst formulating a narrative around the idea of a scholarly poetics—what it would look like, what it could mean, imply and do and, perhaps most importantly, what it could potentially achieve—in relation to our publishing practices, I want to argue that we should pay more attention to how we craft our own poetics as scholars. Just as we have internal discussions about the contents of our scholarship, about the methodologies, theories and politics we use to give meaning and structure to our research, we should similarly have these kinds of discussions about the way we do research. Thus we should also be focusing on the medial forms, the formats and the graphic space in and through which we communicate and perform scholarship (and the discourses that surround these), as well as the structures and institutions that shape and determine our scholarly practices. This ‘contextual’ discussion, focusing on the materiality of our (textual) scholarship and its material modes of production, is and should not in any way be separate from a discussion on the contents of our work. The way we do scholarship informs its ‘outcomes’, what scholarship looks like. It informs the kinds of methodologies, theories and politics we can choose from, and of course, vice versa, these again shape the way we perform our scholarship. A focus on scholarly poethics might therefore be useful in bridging the context/content divide. So what then is the altered status of a (digital) scholarly poethics today? Which theoretical streams, disciplinary fields, and schools of thought (inside and outside of academia, connecting the arts and the humanities) have specifically incorporated attention to the practices and performances of scholarship and this internal/external divide? Here it would be useful to look to fields such as design, poetry, science and technology studies (STS), feminist theory, the (radical) open access movement, and—in some instances the digital humanities and in cultural and literary studies—where the way we conduct scholarship can be seen to have been at the forefront of academic inquiries. What can we learn from these discussions and how can we add to and expand them to enrich our understanding of what a scholarly poethics could be(come)? As I envision it a scholarly poethics is not one thing, not a specific prescriptive methodology or way of doing scholarship, it is a plural and evolving process in which content and context co-develop. Scholarly poethics thus focuses on the abundant, and continuously changing material-discursive attitudes towards scholarly practices, research, communication media (text/film/audio) and institutions. the materiality of our (textual) scholarship and its material modes of production, is and should not in any way be separate from a discussion on the content of our work. If performative publications are the material expressions or incarnations of specific research projects and processes, entangled with them are various other agencies of production and constraint (i.e. technological, authorial, cultural and discursive agencies, to name just a few). What I want to argue is that performative publications as a specific subset of publications actively interrogate how to align more closely the material form of a publication with its content (in other words, where all publications are performative—i.e. they are knowledge shaping, active agents involved in knowledge production—not all publications are 'performative publications', in the sense that they actively interrogate or experiment with this relation between content and materiality —similar to artist books). Yet in addition to this there is also an openness towards the ongoing interaction between materiality and content which includes entanglements with other agencies, and material forms of constraint and possibility. This concern for the materiality and form of our publications (and directly related to that the material production and political economy that surrounds a publication) is not a response to what elsewhere as part of a critique of certain tendencies within the field of new materialism is seen as a reaction to ‘the linguistic turn’ (Bruining 2013). On the contrary, I see this as a more direct reaction against perspectives on the digital which perceive digital text as disembodied and as a freeing of data from its material constraints as part of a conversion to a digital environment. However, content cannot be separated that easily from its material manifestations, as many theorist within the digital humanities have already argued (i.e. Hayles, Drucker). Alan Liu classifies this 'database' rhetoric of dematerialization as a religion that is characterised by 'an ideology of strict division between content and presentation' where content is separated from material instantiation or formal presentation as part of an aesthetics of network production and consumption (Liu 2004, 62). A performative publication wants to explore how we can bring together and align more closely the material form of a publication with its content. Liberature is a term, concept and genre coined in 1999 by the Polish avant-garde poet Zenon Fajfer, and further developed by his collaborator: literary scholar and theorist Katarzyna Bazarnik. Liberature is literature in the form of the book. Bazarnik and Fajfer define liberature as ‘a literary genre that integrates text and its material foundation into a meaningful whole' (Bazarnik and Fajfer 2010, 1). In the introduction to Fajfer’s collected essays, Bazarnik describes liberature as literary works in which the artistic message is transmitted not only through the verbal medium, but also through the author ‘speaking’ via the book as a whole (Bazarnik 2010, 7). Liberature is therefore a total approach that reaches beyond the linguistic medium, where the material form of the work is essential to its understanding and forms an organic element of the (inseparable) whole. Both Fajfer and Bazarnik emphasise that in liberature, the material book is no longer a neutral container for a text, but becomes an integral component of the literary work. Katarzyna Bazarnik, Zenon Fajfer, Oka-leczenie [Eyes-ore] (2000), Liberatura vol. 8, Kraków: Korporacja Ha!art, 2009. Fajfer and Bazarnik make some interesting observations on how in liberature the book does not contain the work, it is the work. In this sense they don’t see the material book as a representation of the work but as something that actively shapes and determines the work. If I emphasise this bodily, material aspect so much, it is because Polish literary studies seem still dominated by scholars indebted to Roman Ingarden, a Polish philosopher who ventured into literary studies to produce a highly influential theory of the literary work of art in which he denied its “material foundation” (as he called it) any significance. It was to be passed over and not interfere with reading (Fajfer and Bazarnik 2010). I believe that it is his responsibility to consider the physical shape of the book and all the matters entailed, just as he considers the text (if not to the same extent, he should at least bear them in mind). The shape of the book should not be determined by generally accepted conventions but result from the author’s autonomous decision just as actions of his characters and the choice of words originate from him (Fajfer 2010, 25). This website and the accompanying posters have been designed by Nabaa Baqir, Mila Spasova and Serhan Curti, 2nd year design students at Coventry University, as part of a project on performative publications run by Janneke Adema. They offer a different take on the article 'The political nature of the book. On artists' books and radical open access', written by Janneke Adema and Gary Hall and originally published in the journal New Formations. I would like to further extend this practice-based project, both theoretically and practically, by discussing the genealogy and correlations of ‘performative publishing’ with ideas such as ‘technotext’ (Hayles), ‘performative materiality’ (Drucker) and ‘liberature’ (Fajfer), and the ethical and political challenges towards academic publishing these kind of concepts and practices pose. This article for The disrupted Journal of Media Practice focuses on performative publications and is itself at the same time a performative publication. Written in Hypothes.is this article will hinge upon specific aspects, fragments, and concepts of the original performative project that it engages, entangling the community’s engagements along the way. I would like to further extend this practice-based project both theoretically and practically, by discussing the genealogy and correlations of ‘performative publishing’ with ideas such as ‘technotext’ (Hayles), ‘performative materiality’ (Drucker) and ‘liberature’ (Fajfer), alongside other projects and practices. As part of this I would like to explore the ethical and political challenges towards academic publishing these kind of concepts and practices pose. By using hypothes.is—an open source software/browser extension that enables an annotation layer on top of websites and online files and objects—which for this special disrupted issue of the Journal of Media Practice functions as a way to enable conversations around its processual papers, I would like to draw in these conversations around performative publications by directly setting up a dialogue with various theorists and the works, concepts, practices and values that connect to both this project and to performative publications as I envision them more in general. My incli-nation is to respond by identifying a certain poetics of responsibilitywith the courage of the swerve, the project of the wager—what I call apoethical attitude. Can this text become the margin of a margin?Where has the body of the text gone when themargin is no longer a secondary virginity but aninexhaustible reserve, the stereographic activity ofan entirely other ear? Instead of developing new, singular, or at least specifi c theories of the politics of new media, critics have for the most part tended to understand digital politics in terms of already decided and legitimated theories and ideas. The PPJ is designed to crawl the web, listening for conversations in which philosophical ideas and approaches are brought to bear on a wide variety of issues of public concern. Once these conversations are curated and a select number chosen for further development, we will invite participants into a space of collaborative writing so they can work their ideas up into a more fully formulated scholarly article or digital artifact. book, which they have ignored so far. This is, I believe, the only way of saving hardcopy books from obliteration by electronic media. The book (from Latin “liber”) is a part of the work; its physical shape and structure constitute its integral part. So it is not easy to take out the text and place it in the virtual space since in the liberatic work the space in which words are con-tained is not neutral. Otherwise, one would have to agree with Raymond Federman and admit that one shares the au‑thorship of one’s masterpieces with the editor, typesetter, and man‑uscript reviser; and what writer would like to do that? I believe that it is his responsibility to consider the physical shape of the book and all the matters entailed, just as he considers the text (if not to the same extent, he should at least bear them in mind). The shape of the book should not be determined by generally accepted conventions but result from the author’s autonomous decision just as actions of his characters and the choice of words originate from him. There are literary works in which the artistic message is transmitted not only through the verbal medium, but also through the author “speaking” via book as a whole. In preparing each publication we pay special attention to the author's intentions,trying to establish or restore the original layout usually ruined by editors who, strange asit may seem, usually disregard the author's design. it is the writer who intentionally shapes the form of the book to suit the text. If I emphasise this bodily, material aspect so much, it is because Polish literarystudies seem still dominated by scholars indebted to Roman Ingarden, a Polishphilosopher who ventured into literary studies to produce a highly influential theory ofthe literary work of art6 in which he denied its “material foundation” (as he called it)any significance. It was to be passed over and not interfere with reading. In spite of the networked condition of textual produc-tion, the design of digital platforms for daily use has hardly begun to accommodate the imaginative possibilities of con -stellationary composition, graphic interpretation, and dia-grammatic writing. We may use mind mapping or other schematic approaches to outline a plan, sketch an argument, organize information flows, or do other tasks that abstract process into graphic forms. We may read through our links and click trails, follow our associations of thought in tracking one thing after another through browsers and faceted search-ing. But very few acts of composition are diagrammatic, con -stellationary, or associative. Fewer are visual or spatial. The predominant modes of composition in digital displays have remained quite linear, even when they have combinatoric or modular underpinnings. What is certain is that poetics in general, and narratology in particular, must not limit itself to accounting for existing forms or themes. It must also explore the field of what is possible or even impossible without pausing too long at that frontier the mapping out of which is not its job. Until now, critics have done no more than interpret literature. Transforming is now the task at hand. That is certainly not the business of theoreticians alone; their role is no doubt negligible. Still, what would theory be worth if it were not also good for inventing practice? disruptive if it remains behind a paywall? I would be interested to hear more about issues of academic labor in relationship to OA in specific. One of the issues that we continue to encounter in forms of what we have called more 'radical' open access practices, in specific academic-led projects and experimental publishing endeavours, is that the amount of free labour increases significantly (and this is of course what publishers traditionally offer to researchers, they facilitate many of the publishing processes). So, where there has been a call to only give one's free academic labour to NFP or open access initiatives (and not to Elsevier or Academia.edu for example), although this might be a more ethical use of academic labour, this does not solve the underlying issue of 'un(der)paid labor' in academia as such. So does this mean we need to work towards more recognition for the types of free labor academics do (from reviewing to editing, to board memberships, to what have you?) and to have this included more directly in impact statements etc. Or does this just lead to a further instrumentalisation of academic job specifications? Is there a tension here too between narratives that see this kind of work as part of an academic 'gift economy' versus those that stress 'free and un(der)paid labour'? Can a researcher blog be considered a reliable and legitimate (triangulating) method of working? The research blog or blogging as a research method is an intriguing question indeed. But what makes a blog, or better said, the specific usage of a blog into a suitable scholarly 'method' -- for you and/or for others? A blog in itself is a medium/a publishing platform. A method then is a certain approach to a blog, how you implement it into research strategies. If you make the case for (a specific use of) a blog, what makes it a potentially more useful research method (for you and others) than, for example, methods based on the usage of other (print-based) media? A similar project that explores the potential and limits of POD is AND's Variable Format: 'a sample book, a model, a serial system that explores the technological margins of print on demand and how reading is informed by the materiality of the book object'.